Check out the free software written by Adam Fulara. To install: unpack, and copy JS/VST files to JS folder. If you want to run it as VST, you will need free ReaJS VST plugin. Change range of Midi dynamics. Input instrument volume level: from "Low" to "Hi". Output from 1-127 (full range + 0 for silent). Knee - like linear, but you can change knee of dependency. Mouse-touchpad changes knee. 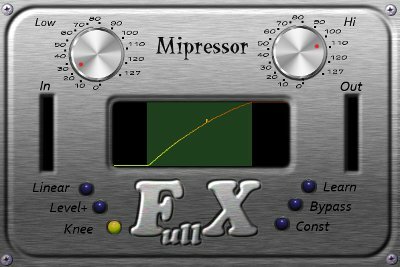 Learn - learn Mipressor levels: play louder and silent notes, then change to one of above options. Low and Hi will be equal to loudes and silentest notes played. Const - All notes the same level. Mouse-touchpad changes volume. Usage: Insert this JS plugin before VSTi When you want to have VST instead of JS then use ReaJS free plugin Hidden sliders are available for automation. Enjoy. Mibrato is the MIDI JS effect (VST compatibile), working with Reaper, and with any VST host after installing ReaJS VST plugin. What for is it? It will generate pitch bends MIDI traffic for your VSTi instruments. It was especially tested and designed to use with Axon 100 MK II Midi controller, with separate 6 channels signal, and pitchbend control for each string on separate channel. Mibrato MIDI Channel - Channel used to generate pitch bend. Should be the same, as played instrument channel. Option ALL generates MIDI on all MIDI Channels, option Axon MK II is for Terratec Axon MK II guitar MIDI synth where you have 6 channels on output. 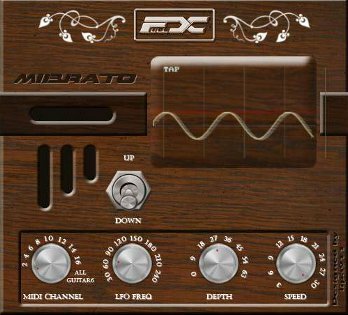 Mibrato LFO Ferequency - it's ferequency of LFO wave, 20 means 1 sec. It's 1/3 of the BPM number. Mibrato Depth - Strength of vibrato effect. Mibrato Kind of Bend - Kind of vibrato, only UP direction vibrato (like fingers on the string of guitar), middle vibrato (default), down direction vibrato. Mibrato MIDI break-number of ASIO/WDM buffers between 2 pitch change updates. The smaller the faster, but generates more MIDI traffic. Default is 1 MIDI message every 3 ASIO buffers. It generates MIDI only when you play. TAP TEMPO - Midi CC controller with Tap Tempo. CC message No. 26 (decimal) with time of tap in 1/100 sec. TAP FROM PROJECT - click RIGHT mouse to fit LFO to project: first Click: 1 LFO cycle for every eight note, the second: two cycles per eight note, third: triplet (aka 1.5 cycle eight per note). Pitch WHEEL is working with Mibrato. You can still use WHEEL to control the pitch. Mibrato "eat" Wheel messages, and transposes LFO up. Although it needs some "headroom" to make vibrato, so it's limited. Wheel not works if you use maximum depth. Mibrato Greed is about 1 second long (from left to right). Red horizontal line: original pitch, vertical lines: eight notes from project (darker) and quarter notes (stronger color). Blue line - horizontal sine zero line. Realtime updates of the grid and sound, also for real Wheel actions. Animation when playing. This software is provided "as" is, without any express or implied warranty. In no event will the authors be held liable for any damages arising from the use of this software. It's a free plugin for DAW software like Reaper, Cubase, Ableton etc dedicated to get more control using MIDI guitar synths like Axon AX 100, AX 50, Roland etc. with software sound module like NI Kontakt. Usualy mode of working is output 6 MIDI channels from guitar synth with separate MIDI signal from each string. It requires 6 channels in your DAW and 6 instances of Kontakt (it requires CPU and memory resources). You can use "MIDI OMNI" mode to play all 6 strings on one instance of Kontakt, but the problem is, that it can not interpret pitch bends from each string. When you make pitch bend on one string - it affects to anothers. Instalation: in Reaper just copy first file to JS plugin directory, or if you don't know your plugin directory, in Reaper: FX (on track) > press A > right button mouse on JS > Create new JS FX > name: Full/X AXON pitch v. 1.0 > Edit > delete all contens > paste downloaded Full/X AXON pitch file from notepad into this plugin. You can use it in Cubase downloading ReaJS VST free plugin. In NI Kontakt, open details of the instrument > Script Editor > choice one empty > Edit > paste KSP script from Notepad. Configuration: Choice Midi out channel in JS/VST plugin, then choice the same MIDI channel in Kontakt, Enjoy playing guitar with one instance of NI Kontakt and acurate pitch bends. JS script generates MIDI Clock + SPP (Song Pointer Position) for synchronization Reaper sequencer with external devices like drum machines, keyboards etc. Since 3.4 built in external clock doesn't work properly. You can have less than 1 ms synchronization using this plugin. Instalation: unpack and copy downloaded file to Reaper JS plugin directory, or unpack and open downloaded file using Notepad editor -> copy plugin text -> create new track -> press FX button-> press A -> right mouse button on JS -> "Create new js fx" - name: "X Midi Clock + SPP v. 1.0" -> press Edit -> press Ctrl+A -> press Del -> Paste Plugin text -> Save -> Compile All. In another sequencer (like Cubase) you would need free VST ReaJS plugin to do that. Configuration: Create new MIDI track. Turn on this plugin (press FX -> Full/X Midi Clock + SPP), press IO button on the same track -> "MIDI Hardware Output" choice MIDI OUT port of your soundcard. Simple JS plugin (for Reaper or any VST host via ReaJS) for dumping empty guitar/bass strings (you can use max 12 strings guitars). It's feature needed for tapping playing. Instalation: like other JS plugins (see above). 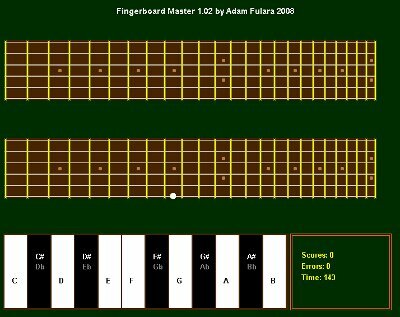 String tunning list (12 sliders) - tunning of each string you use (One channel=one string). Default: Adam's tunning E B G D A E + B G D A E B. Place it at the beginning of the plugins chain. Jave Game for mobile phones. 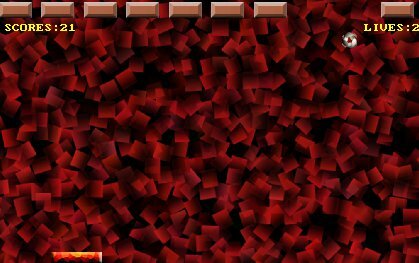 Arkanoid JS Game made by Maciej Czekaj. It's JS/VST effect with famous Arkanoid Game. Install as JS Reaper's effect.